CellPhone-Mate five-band amplifier is a complete solution for medium, small businesses and large homes. The SureCall FUSION-5 SC-PolyH/O-72-OD-Kit is the five-band amplifier kit designed as a cost-effective all-in-one cellular voice and data solution for medium businesses, small businesses and larger homes. It combines PCS and Cellular dual-bands with LTE and AWS frequencies for Verizon, AT&T and T-Mobile as a total 2G through 4G cellular amplification solution. 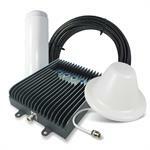 This full-featured complete kit comes with amplifier, wide-band omni antennas, cabling kit and accessories. It is ideal for locations with a low cellular signal. Covers up to 10,000 square ft. for 3G voice and 4G data.